What is a city anyway? Try to answer that; it’s not as easy as you think. We could say it’s a collection of people united by not just geography but an ever-changing culture, economy, and social practices. We could say it’s the political structures, community organizations and the power dynamics of who is at the table making decisions. We could say it is the on-going accumulation of experiences we all have as we drift within this place, living our lives. We could say it’s the people, some of who are new, some who have been here for ages, and some who are being cruelly pushed out. However you start answering that question, it becomes clear that the definition is complex, messy and hard to pin down. Whatever a city is, it is always in the process of becoming. Shaping its future requires constant dialogue among us all. We need a place for that dialogue. And The Urbanist has become that place. Can you imagine where we would be without them? They are a team of great writers who inform, provoke, and inspire. They are super nerds about policy and history, who happily go deep into the details and explain what others miss. They are bricoleurs who find the cool stuff other cities are doing and examine how we might adapt and transplant good ideas here. As needed, they poke at elected leaders or other power players when they fail to act for the well-being of people and planet. They are hopeful activists who help organize us around solutions that will improve lives. In some ways, it’s a miracle that The Urbanist exists at all. It’s hella hard work, powered by mostly volunteer energy. Their written pieces are consistently high quality and thought-provoking. How do they do that, day after day, when most of us are exhausted and worried and maybe feel like being snarky and cynical? As I watch the dark energy of Trump, the energy that sows mistrust, creates fear, attacks democracy, pushes people to disassociate from our collective responsibility, I realize venues like The Urbanist serve as an essential backstop to that. When we focus our energy on city-making, we ground ourselves in physical space, rooting ourselves psychologically and emotionally. When we orient ourselves as caretakers of someplace tangible, we recognize our responsibility to our fellow humans. When we work locally, learning the tools that shape our city’s future, we keep alive the fundamental questions: how we live in relation to one another, to nature, how we build the physical environment that allows us all to thrive. The Urbanist hosts this essential dialogue, reminding us that our city is always in the state of becoming, inviting us to imagine possible futures. As other places are lamenting the loss of local media and facing the rise of mistrust and alienation, we are fortunate to have The Urbanist. Don’t you love The Urbanist? Let’s all show them the heaps of gratitude they deserve and help sustain their work. 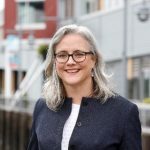 Cary Moon ran for Mayor of Seattle in 2017 and earned The Urbanist’s endorsement in a crowded primary. Cary Moon co-founded the People's Waterfront Coalition, a campaign to re-open Seattle's waterfront as part of the replacement of the Alaskan Way Viaduct, in 2004. She was a candidate for Mayor of Seattle in the 2017 mayoral election, finishing second in the primary and advancing to face Jenny Durkan.